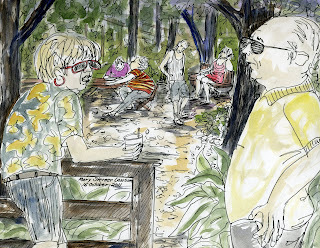 Hi World Wide Sketchercrawlers! Just in: a new image from Bill Otersen, the creator of the "Mr. Stupid" character and his world; Thanks, Bill! and the gazebo where the wedding was planned to be. It was under beautiful huge trees that lost their yellow leaves in the 50 mph winds on crawl day. It looks like the gazebo will blow over in my sketch, altho the huge tree trunks barely flexed). Of course the wedding had to be moved indoors. 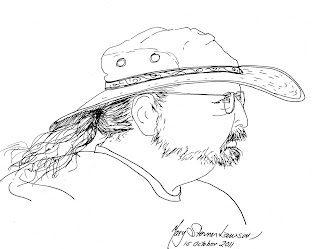 Our first contributions for World Wide SketchCrawl number 33 came from Mary Sterner Lawson who chose these 4: Others in our group sketched but haven't scanned or sent yet; please check back to see more sketches posted as they come in. Last edited by markfletcher on Mon Oct 24, 2011 3:00 am, edited 5 times in total. Thank you Mark for visiting Seoul Results! 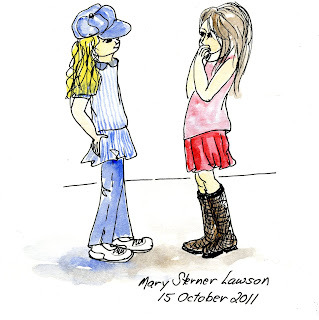 Figure drawings of Mary Strner Lawson are lively. Especially the metaphysician sketch is wonderful. We look forward to seeing more soon! Fun sketching style!!! Thanks for sharing. Thanks for checking our posts Joan. I am waiting for more images from my group. I was at my sister's wedding in Ohio and haven't unpacked down to my sketch book yet, but will photo and post as soon as I catch up my job's work. Of yours, I liked Susan's Main Greenhouse and Joan's Main Gate the best this time. Now my camera battery is dead! if it's not one thing, it's another! I'll let you know when I get it fixed and post more. 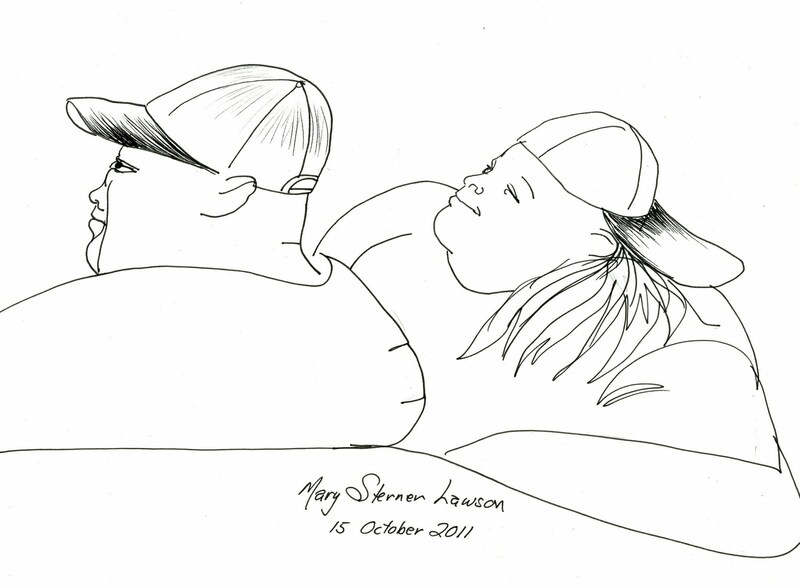 Thanks for checking out Mary's drawings. Nice place for sketching and great results for Tallahasse, full of diversity ! Woww, I admire your passion and spirit for the sketching on the spot! You kept sketching during your sister's wedding and after returning. The covered bridge reminds me of past movies, so warm. And the last scenery drawing makes us guess how the weather was and would be wonderful the space for the wedding. Your try for 'The thinker' is valuable record for both of you. Thank you again for the interest and communication, Mark! Thank you for your thorough and specific comments, B. H.! Of course I tried to keep my pencil still and quiet during the actual wedding ceremony , but there were waiting times leading up to it when I could draw. I liked Yoo Byung Hwa's "Junghwamun" gate/hinge. It reminds me of an unusual support for a building from 100 years ago I sketched. Probably 100 years old is still very young in Korea. Such spendid historic architecture as part of your daily life-- wonderful ! markfletcher - Your dinosaur( made from metal car parts) is terrific!!! and I love the last one with huge trees. Great dynamic feel of nature! Mary - Love your animating detailed Waiting scene and Supersizers is really well captured and so beautifully composed and lovely line work! Bill - Love your each animal drawings! What lovely characters! Glad to see that you've uploaded more sketches. Great job everyone!!! Thanks for your encouragement, Joan. We always enjoy seeing your group's work. 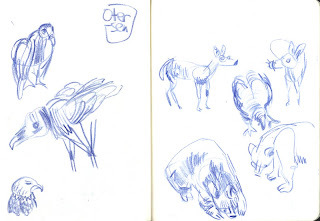 Bill Otersen has done many sketches in NY. Thanks for checking us out again, Kumi!